Brisbane - Skipper Graeme Smith said South Africa had a few things to work on before next week's second Adelaide Test after fighting for a draw with Australia in the Gabba opener on Tuesday. The top-rated Proteas had the better of the match in the opening days, compiling 450 in their first innings. But they were forced to dig in for a draw after Australia gained an innings lead with 565/5 declared in reply. The South Africans were put under pressure by Michael Clarke's declaration but batted out 68 overs to be 166/5 when stumps were drawn early on the final day. Smith said South Africa had a few things to work on for the second Test starting on November 22. "There's enough time to reflect and to get one or two things right for Adelaide," he said. "I felt we were ahead of the game going into day four, 40 for three, we just never quite backed up well enough on day four (Monday)." Michael Clarke and Ed Cowan (136) turned the match around with a record 259-run stand for the fourth wicket and Clarke and Mike Hussey (100) added another 228 for the next wicket to put Australia in front. Clarke was named man-of-the-match for his third double-century of the year, an unbeaten 259. "Michael and Cowan played really well, took the game to us, and we didn't quite respond in the way I've got used to our guys responding," Smith said. "All in all, I think for me a draw was an even reflection on how the surface played and for both teams." 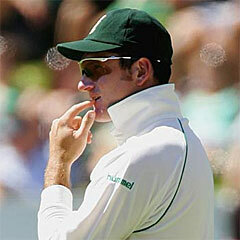 Smith said Saturday's washout and the end-of-play Achilles injury to JP Duminy caused problems for the Proteas. "The rain break probably put us under a bit of unnecessary pressure," he said. "We experienced a very big injury to JP Duminy which put us under a little bit of pressure in terms of picking him as a spinner, and we batted light. "I think we just didn't hit our straps with the ball - 450 was a good total, winning the toss and batting. "Certainly Michael (Clarke) and Cowan transferred that pressure onto us and we could have responded a little bit better." Smith expects his vaunted bowling lineup to strike back in Adelaide. "I just don't think we backed up well enough," he said. "We had periods when we were good, then lost our way a little bit. "We didn't really bowl well in partnerships to create enough pressure on Australia's batting, certainly on day four. "All in all, I cannot complain about our bowlers. The majority of the time they rock up and they perform extremely well. Hopefully that will happen in Adelaide again."